Car shopping for a new BMW in the Ballwin area? Look no further than the new vehicle inventory at BMW of West St Louis. We have a wide variety of models in stock, from the popular BMW X3 to the fan favorite 5 Series. When you’re ready to take your Ladue commute or St. Louis family outing to the next level with a sleek new BMW, stop by BMW of West St Louis to peruse the BMW models for sale in Manchester, MO! Olive 2019 BMW X1 xDrive28i AWD 8-Speed Automatic 2.0L 4-Cylinder DOHC 16V TwinPower Turbo 22/31 City/Highway MPG Whether you are interested in learning more about our team or are ready to begin shopping with us, we invite you to visit our showroom today. Conveniently located on Manchester Road just west of Hwy 141 in Manchester, MO, our team looks forward to helping you experience new levels of affordable luxury. *See dealer for details. **Note: All sale prices and discounts listed above, include all available factory incentives, discounts and rebates. Special rates must finance through BMW Financial. These are subject to change at any time. *Must finance with BMW Financial. Blue 2019 BMW X1 xDrive28i AWD 8-Speed Automatic 2.0L 4-Cylinder DOHC 16V TwinPower Turbo 22/31 City/Highway MPG Whether you are interested in learning more about our team or are ready to begin shopping with us, we invite you to visit our showroom today. Conveniently located on Manchester Road just west of Hwy 141 in Manchester, MO, our team looks forward to helping you experience new levels of affordable luxury. *See dealer for details. **Note: All sale prices and discounts listed above, include all available factory incentives, discounts and rebates. Special rates must finance through BMW Financial. These are subject to change at any time. *Must finance with BMW Financial. Original MSRP $43,285.00. Jet Black 2019 BMW X3 sDrive30i RWD 8-Speed Automatic 2.0L I4 TwinPower Turbo 23/30 City/Highway MPG Whether you are interested in learning more about our team or are ready to begin shopping with us, we invite you to visit our showroom today. Conveniently located on Manchester Road just west of Hwy 141 in Manchester, MO, our team looks forward to helping you experience new levels of affordable luxury. *See dealer for details. **Note: All sale prices and discounts listed above, include all available factory incentives, discounts and rebates. Special rates must finance through BMW Financial. These are subject to change at any time. *Must finance with BMW Financial. Jet Black 2019 BMW 3 Series 330i xDrive AWD 8-Speed Automatic 2.0L 4-Cylinder DOHC 16V Turbocharged 25/34 City/Highway MPG Whether you are interested in learning more about our team or are ready to begin shopping with us, we invite you to visit our showroom today. Conveniently located on Manchester Road just west of Hwy 141 in Manchester, MO, our team looks forward to helping you experience new levels of affordable luxury. *See dealer for details. **Note: All sale prices and discounts listed above, include all available factory incentives, discounts and rebates. Special rates must finance through BMW Financial. These are subject to change at any time. *Must finance with BMW Financial. Mineral Grey Metallic 2019 BMW 3 Series 330i xDrive AWD 8-Speed Automatic 2.0L 4-Cylinder DOHC 16V Turbocharged 25/34 City/Highway MPG Whether you are interested in learning more about our team or are ready to begin shopping with us, we invite you to visit our showroom today. Conveniently located on Manchester Road just west of Hwy 141 in Manchester, MO, our team looks forward to helping you experience new levels of affordable luxury. *See dealer for details. **Note: All sale prices and discounts listed above, include all available factory incentives, discounts and rebates. Special rates must finance through BMW Financial. These are subject to change at any time. *Must finance with BMW Financial. Melbourne Red Metallic 2019 BMW 3 Series 330i xDrive AWD 8-Speed Automatic 2.0L 4-Cylinder DOHC 16V Turbocharged 25/34 City/Highway MPG Whether you are interested in learning more about our team or are ready to begin shopping with us, we invite you to visit our showroom today. Conveniently located on Manchester Road just west of Hwy 141 in Manchester, MO, our team looks forward to helping you experience new levels of affordable luxury. *See dealer for details. **Note: All sale prices and discounts listed above, include all available factory incentives, discounts and rebates. Special rates must finance through BMW Financial. These are subject to change at any time. *Must finance with BMW Financial. Alpine White 2019 BMW X3 xDrive30i AWD 8-Speed Automatic 2.0L I4 TwinPower Turbo 22/29 City/Highway MPG Whether you are interested in learning more about our team or are ready to begin shopping with us, we invite you to visit our showroom today. Conveniently located on Manchester Road just west of Hwy 141 in Manchester, MO, our team looks forward to helping you experience new levels of affordable luxury. *See dealer for details. **Note: All sale prices and discounts listed above, include all available factory incentives, discounts and rebates. Special rates must finance through BMW Financial. These are subject to change at any time. *Must finance with BMW Financial. Jet Black 2019 BMW X3 xDrive30i AWD 8-Speed Automatic 2.0L I4 TwinPower Turbo 22/29 City/Highway MPG Whether you are interested in learning more about our team or are ready to begin shopping with us, we invite you to visit our showroom today. Conveniently located on Manchester Road just west of Hwy 141 in Manchester, MO, our team looks forward to helping you experience new levels of affordable luxury. *See dealer for details. **Note: All sale prices and discounts listed above, include all available factory incentives, discounts and rebates. Special rates must finance through BMW Financial. These are subject to change at any time. *Must finance with BMW Financial. Alpine 2019 BMW X3 xDrive30i AWD 8-Speed Automatic 2.0L I4 TwinPower Turbo 22/29 City/Highway MPG Whether you are interested in learning more about our team or are ready to begin shopping with us, we invite you to visit our showroom today. Conveniently located on Manchester Road just west of Hwy 141 in Manchester, MO, our team looks forward to helping you experience new levels of affordable luxury. *See dealer for details. **Note: All sale prices and discounts listed above, include all available factory incentives, discounts and rebates. Special rates must finance through BMW Financial. These are subject to change at any time. *Must finance with BMW Financial. Dark Graphite Metallic 2019 BMW X3 xDrive30i AWD 8-Speed Automatic 2.0L I4 TwinPower Turbo 22/29 City/Highway MPG Whether you are interested in learning more about our team or are ready to begin shopping with us, we invite you to visit our showroom today. Conveniently located on Manchester Road just west of Hwy 141 in Manchester, MO, our team looks forward to helping you experience new levels of affordable luxury. *See dealer for details. **Note: All sale prices and discounts listed above, include all available factory incentives, discounts and rebates. Special rates must finance through BMW Financial. These are subject to change at any time. *Must finance with BMW Financial. 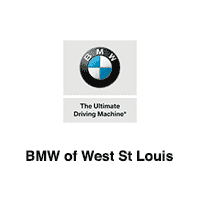 Why Choose BMW of West St Louis for a New BMW? Our sales team is standing by to get you behind the wheel of the BMW model that best suits your budget and driving needs, and it’s their goal to make the car-buying process that much less stressful. We know you’ll find a model you love in our showroom near Ballwin. Contact us today to get the process started, or learn more about the BMW name at BMW of West St Louis.